What have Gorgeous Sassy Girls, great music and flawless dancing got in common? 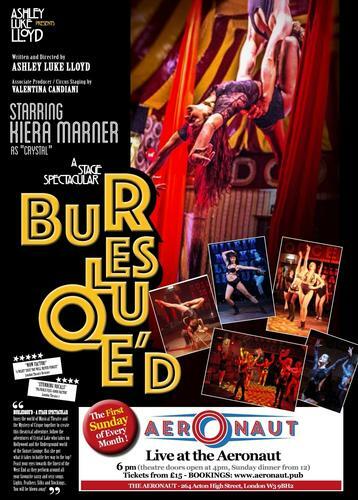 They can all be found in Ashley Luke Lloyd's spectacular Burlesque'd at The Aeronaut. After a break, this show is back. And it is back with a vengeance. With a new leading lady in place, this is a night to remember. Flawless choreography delivered superbly by incredible dancers, phenomenal singers performing incredible songs and jaw-dropping aerial performances. New leading lady Kiera Marner smashes her way into this production as Crystal, with excellent stage presence and the ability to belt out a tune with the best of them. Stepping into this show alongside a cast of this calibre and not looking out of place shows just how good she is. The standout of this production (besides the incredible dancing girls) is the duet with the fantastic Brooke Havana Bailey, and Keira's vocals shine through in this belter of a song. Alongside this powerhouse duo, the audience is also entertained superbly by Emily Shuck's stunning vocals and characterization as Chess, and James Paton and Valentina Canadiani, as not only well rounded and loveable characters but also as phenomenal Aerial Acrobats. There is something in this show for everyone. The only problem with the show is that it is only performed once a month. This production is one that deserves to be performed every night of the week to a sell out crowd. The passion and talent of this cast delivers an outstanding night of entertainment that everyone needs to see. It runs at The Aeronaut the fisr Sunday of every month.